Oh good. You’ve got past the scary title. I know, I know. I go from sugar and spice and everything nice, to sardines and chermoula. That’s what you get when you come here: the unexpected, the unusual…the unpronounceable. Apologies are due if you were lured in by last week’s summer berries crumble tart, a crisp pastry sheet cradling a Queen’s ransom of jewel-like fruits. It was really lovely: not too sweet, lots of colour and juice. A simple summer pud for pud-deniers. But hey, I’m a savoury girl at heart. 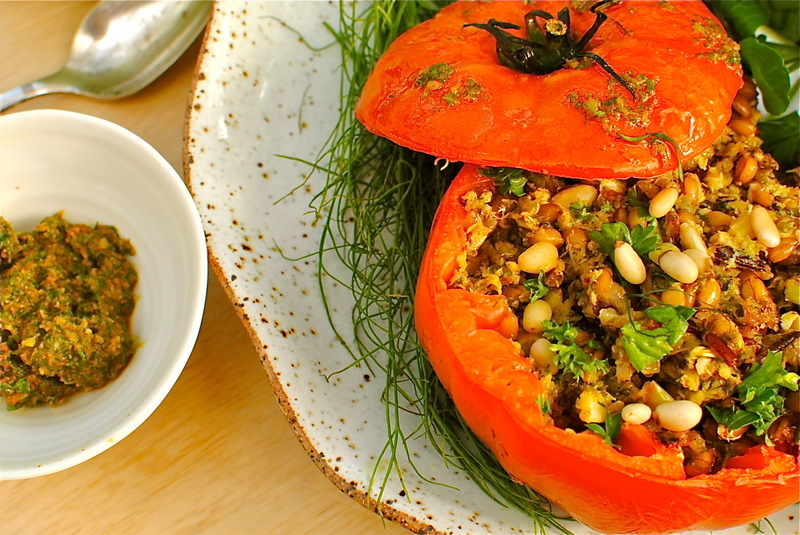 A savoury girl who wants you to scoop out the fattest, reddest tomatoes you can find, and fill them to the brim with chermoula-laced whole grains, herbs and, erm, fish. Stop making that face. I can see you. Honestly. Have I ever lied to you? So, the chermoula. What in Heaven’s name is that, you may be asking yourself. According to chefzadi, “it’s a marinade, a dip, a sauce, a dressing, a spread.” It can also be seen as a pesto, which is really any fragrant assembly of aromatics, oil and herbs pounded to make an even more fragrant paste. Used extensively in North African cooking, chermoula typically binds together coriander (cilantro) or parsley, olive oil, lemon (preserved or not), garlic, paprika and cumin. But any search of Algerian, Moroccan or Tunisian cookbooks will show just how flexible and inclusive is chermoula. I’m just not sure if replacing coriander with fennel fronds and mint quite makes the cut. But I promise you it is quite delicious. Until corrected I will stick my neck out and declare it a kind of chermoula. Besides, if I had called it pesto, you would’ve thought I was taking the mickey. My use of chermoula in this way is one I have not come across but I promise you that it works exceptionally well. Mr A actually licked the plate and asked me to make it again next week. 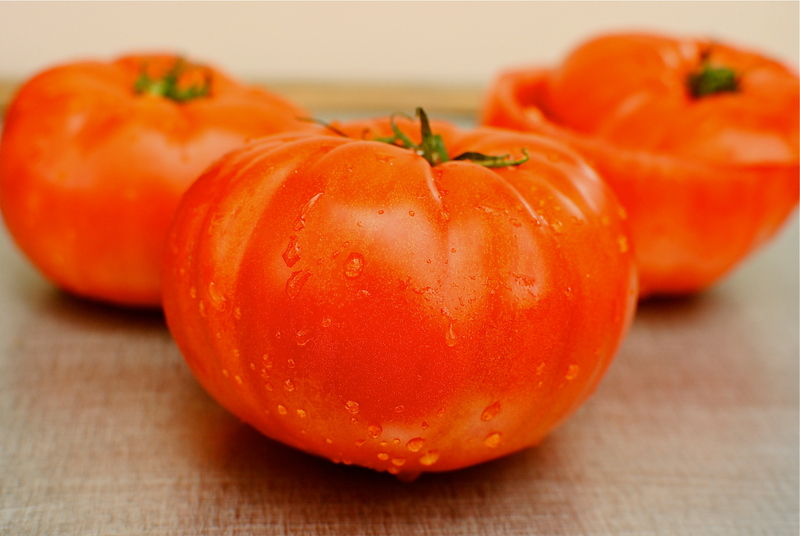 This simple recipe – inspired by some buxom Marmande(Marmonde) tomatoes on sale at Earthy in Canonmills, Edinburgh – also dovetails nicely with my desire to have a Spanish-Mediterranean vibe over the next few posts. I know it looks a bit worthy and hemp-sandally but I urge you to try it. And, because I like you so much, I’ve got an even quicker, and vegan, use for the leftover chermoula following the main recipe. I am trying it out on my nutrition class tomorrow. I hope it gets a thumbs-up 😀 In any case Mr A has just come in from work, found the leftover pot of it and eaten it all in one go with his finger. Praise indeed. A little bit Mediterranean, a little bit Moroccan, a lot a bit tasty. IMHO. This easy recipe is a great way to get even the most ardent sardine-phobes eating the king of Omega 3 fish, the humble sardine. 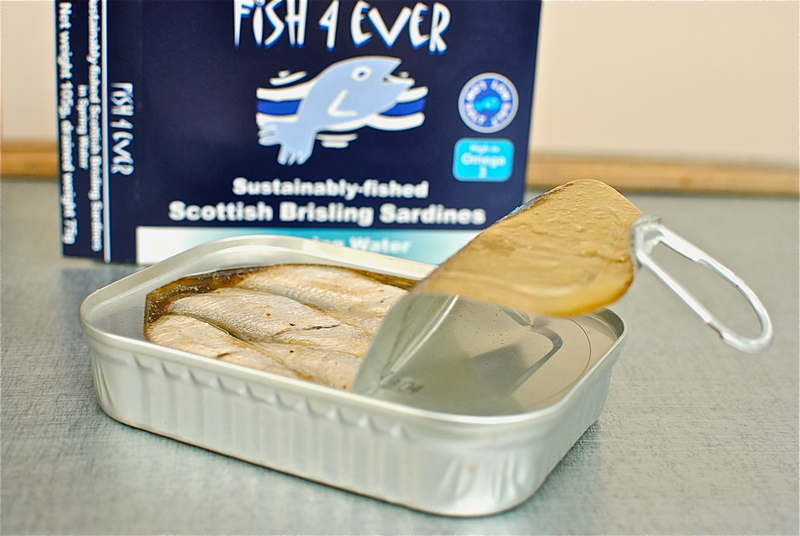 I’ve used sustainably-fished Scottish tinned sardines from Fish 4 Ever, but use whatever best-quality sardines or mackerel you can get hold of – in spring water; hold the salt. If using fresh sardines- or even mackerel – fillet them and lightly poach first. Here’s how to tackle the filleting. 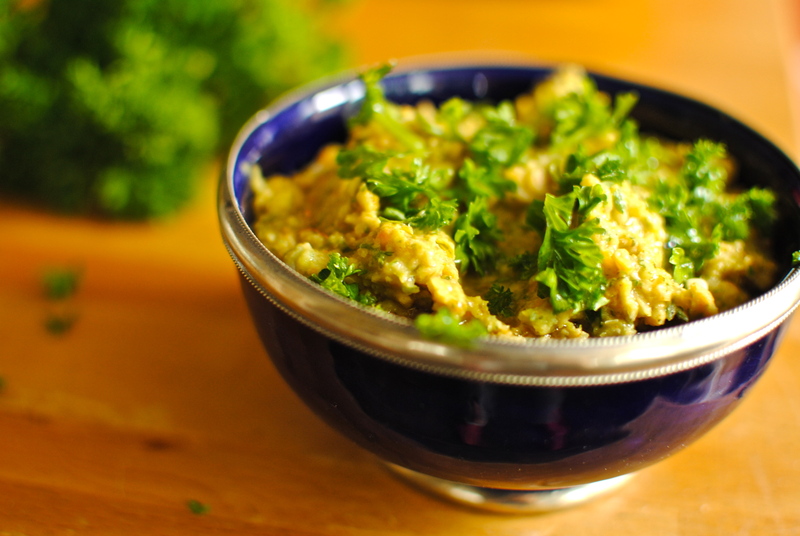 The chermoula, a North African pesto of fresh herbs, cumin, paprika and lemon, is a fabulous way to add a lift to white or oily fish, grains (think herb and veg spiked salads), chicken, vegetables (kebabs on the BBQ perhaps) and dressings. It also makes an outstandingly zippy dip too (see below). You will probably use about half of the amount this makes so pop the rest in a small jar and top with a little oil to cover. Use this pesto within a week, or freeze by the tablespoon in an ice cube tray to add into minestrone or any boring supermarket soup. Or, do as I did and make a quick and nutritious dip. 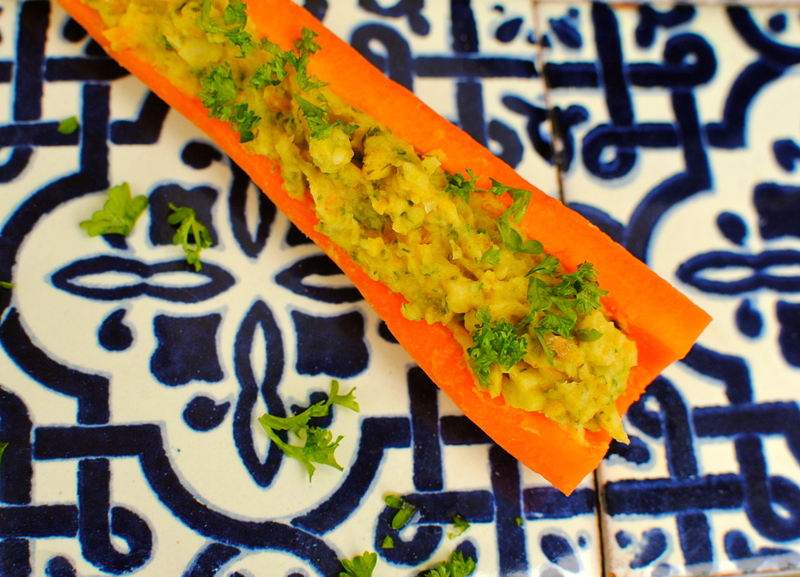 Conner Middelman-Whitney’s fantastic book, Zest for Life, provided the template for the chermoula, but I changed the proportions a bit and used mint and fennel instead of coriander (very unconventional for a chermoula – might be illegal) and left out the saffron. I hope she doesn’t mind. 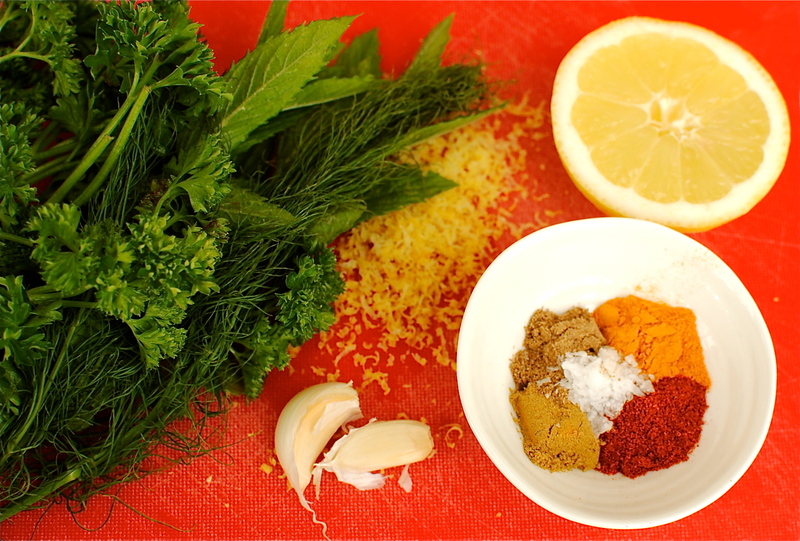 If you are good with a pestle and mortar – how this herby sauce is traditionally made – then go for it. Pound away. Me? I’m a bit rubbish and frankly quite lazy so electric mini chopper it is. Whatever method, pulverise all of the chermoula ingredients and set it aside for now. 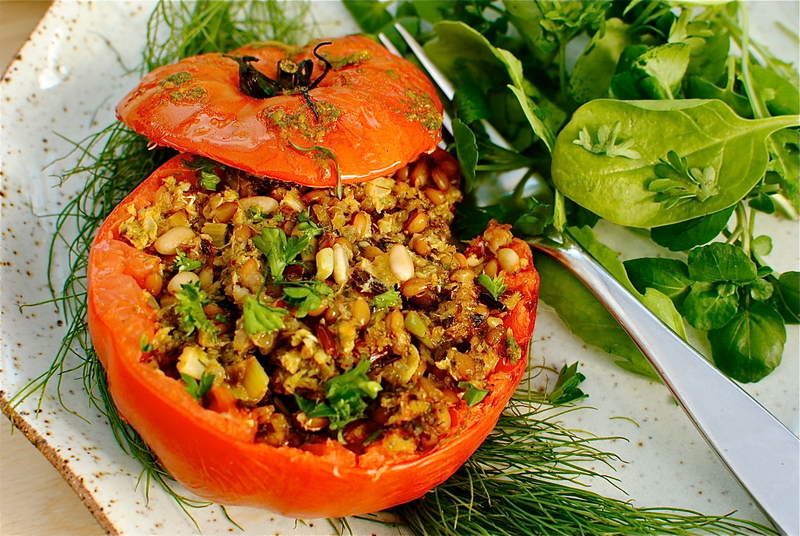 8 heaped tbsp of ready-to-eat grains (gluten-free or not)- leftovers or from a pack. I used a supermarket-own pack bought at Waitrose, but most supermarkets have something suitable. Merchant Gourmet is stocked in larger UK supermarkets. Slice off the top of each tomato to make a lid for the stuffed tomato. Scoop out the seeds and watery bits, and save it for another purpose (I added mine to a supermarket soup along with leftover grains). 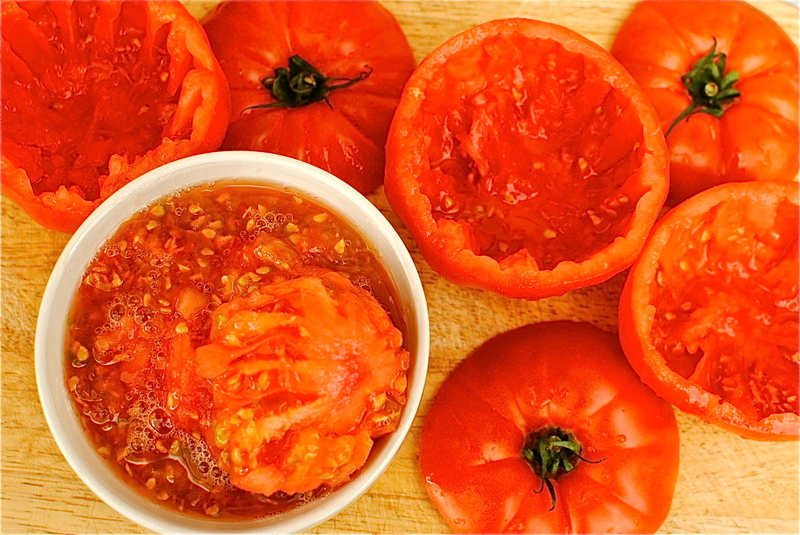 Turn the tomato ‘shells’ upside down on a few layers of paper towel while you sort the filling. Heat 1 tsp of olive oil in a small pan and lightly fry the spring onions, fennel and chilli (or you could just use them raw). Pop the cooked vegetables in a mixing bowl with the ready-to-eat grains, the drained sardines and 2 tablespoons of chermoula, mix well with your hands and check the seasoning – maybe adding more salt or lemon. Spoon equal amounts of the spiced sardine mix into the tomato shells, sprinkle on the pine nuts; pop on the lids (or not; it doesn’t matter) and slick with a little extra chermoula that has been slaked with some oil. Put the stuffed tomatoes on a baking tray and bake at 200C/400F for 15 minutes. Serve with a sharp salad and maybe some good, lactic-ey sourdough bread – the latter is Mr A’s suggestion for mopping up all the tray juices. Super speedy version: Use a prepared paste, such as harissa (Belazu’s Rose Harissa is divine. A staple ingredient for me) or a coriander pesto. Variations: Use this mix to stuff marrows or large sweet peppers. 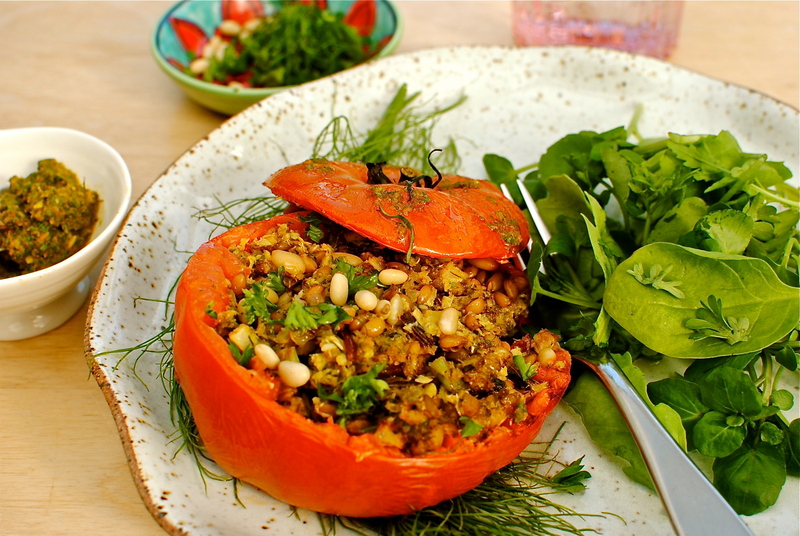 Make it vegan by swapping the fish for some cooked lentils or use a ready-to-eat grain and lentil mix. Using ‘leftover’ chermoula, this could not be a simpler. Chermoula recipe above. Lightly sauté the carrot, fennel and onion in a little oil. 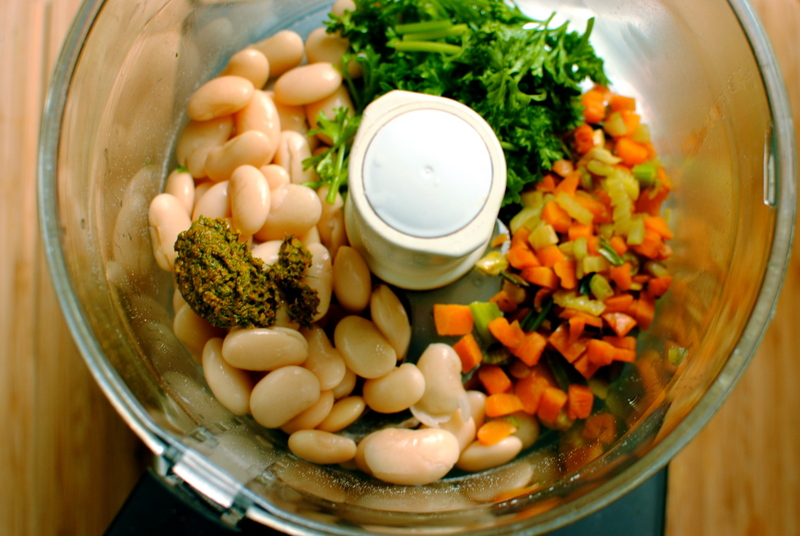 Pop everything in a food processor and pulse, adding a little olive oil and lemon juice to loosen and add blending. Taste for seasoning and serve with crudite and bread. Thanks so much. Glad it didn’t scare you away! Cheers EA.I was wondering if ready-made g-f puff pastry is available to you. In any case the ‘innards’ would be nice baked as a British summer pudding using gluten free bread. I recently thought of a gooseberry version of a summer pudding that I might try first with gf bread. Just not as colourful as those photogenic berries. PS On the mend. Too slowly for my liking though. wow, some great recipes right there! 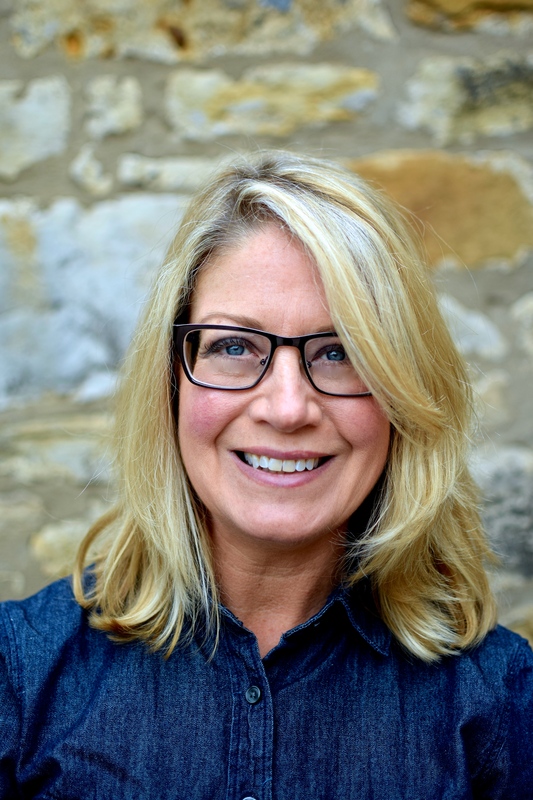 You never fail to impress me with your creative blog posts! 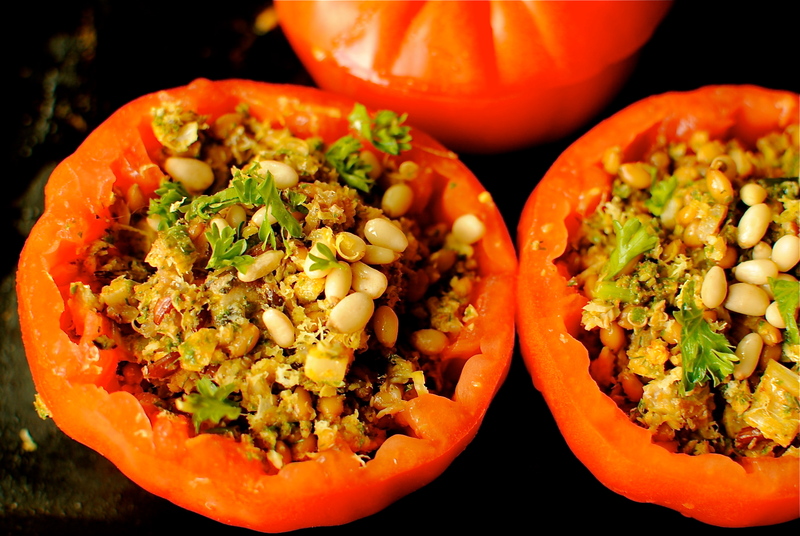 I absolutely love your stuffed tomatoes and cant wait to make a version of it. 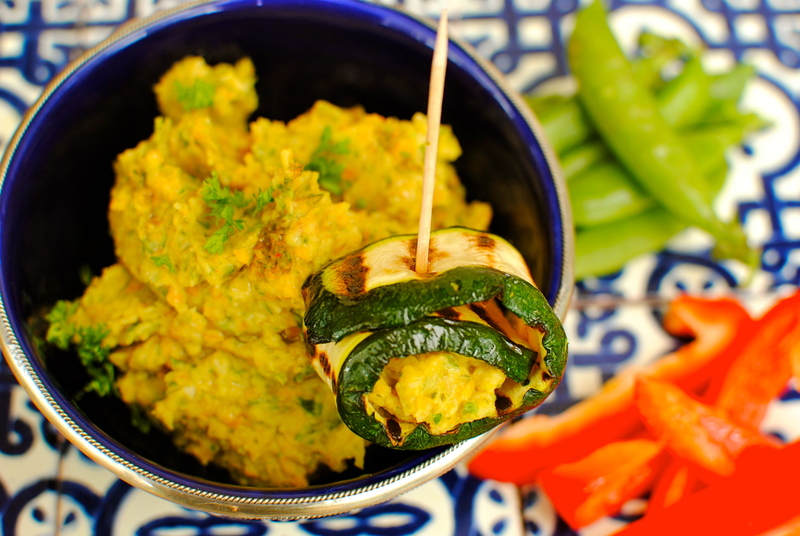 The white bean dip would go well with lots of other dishes, as a dip and snack! This recipe is really calling my name tonight! Thanks for your extremely kind comment Alexia. I’m a savoury gal too so this sounds lovely, although my husband has a near pathological fear of whole cooked tomatoes so I’ll prob make it in peppers to avoid scaring him ;). Totally agree about the Belazu rose harissa, it’s yum. Yeah, go for the pepper version – those long Spanish ones would be perfect. My neighbour will soon be leaving giant marrows at my doorstep that I will use for this recipe. Big marrows are terribly intimidating. A bit little shop of horrors. I will tame them with chermoula! Yum, I love this! I’ve never heard of chermoula before but it sounds delicious! Since I have an over-abundance of baked good recipes I’m so glad you’re a savoury girl at heart and are sharing awesome recipes like this one. Aw shucks *blushes*. I’m finally compiling an index so you & others can easily sift through all my recipes. The savoury columns are outweighing the sweet 4:1! Mmm, absolutely yumo looking. I am literally on my way to collect the ingredients as I shall make this at the weekend. In fact, I shall make it for Emma as she is coming round before the Madonna concert tomorrow. LOVE your red & green photos – they go BOUM – and jump right into my ‘must make’ pile. Lovely, thanks for this. Well you are right, we could just stand in the garden but Emma being efficient Emma secured tickets the day they went on sale so its the real McCoy albeit the very back row of the upper tier…and so what to wear…..
Chermoula packs such a lovely flavor punch and it’s been far too long since I’ve made it! It’s just one of those things that I love but doesn’t immediately come to mind when I’m meal-planning. I have a serious craving for it now though and it sounds delicious in this dish. I bet it really mellows the flavor of sardines.